We're not gonna lie. The lives of beauty editors are filled with girly good times — fragrance breakfasts, mascara cocktail parties, etc — but, every once in awhile, an opportunity comes our way that's genuinely so cool, even the most jaded beauty editor has to pinch herself a bit. Such was the case when we met Linda Flowers, hair-guru extraordinaire and the designer behind all of the incredible hairstyles in the Hunger Games movies, including Katniss' iconic braid and Effie's pink poodle wig. 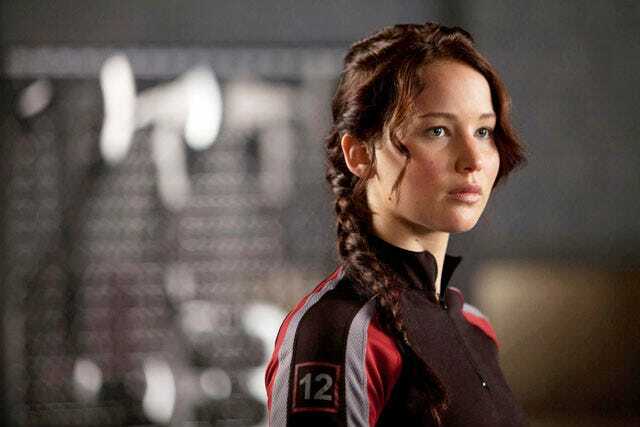 As far as The Braid, Flowers says that Katniss' plait was about both form and function. "I wanted to create a standout style that would make the character instantly recognizable onscreen, and would ensure Katniss never got lost in the fray," explains the hairstylist. "The decision to bring the braid over her shoulder was purely functional — we couldn't have her hair getting caught every time she reached for her bow and arrows!" So, speaking of our lady J. Lawr, you know what our next question for Flowers had to be: After all of that slaving over Jennifer's long locks, what did the stylist think of the actress's decision to go for the pixie? "I have to say, I love the pixie," says Flowers. "Unfortunately, Jennifer's hair got very damaged from going back and forth between being blonde and being brunette." (For the record, the actress prefers her locks on the lighter end of the spectrum.) So, Flowers explains, the chop was partly practical — but, the stylist also has a running theory that Jennifer used the big chop as a catalyst for change. "In my mind, I think that Jennifer was inspired a bit by Anne Hathaway and how fearless she was going short for Les Misérables," says the hairstylist. "I think that Jennifer had a need to prove to herself that she's a 'serious actress' that isn't overly attached to her outer appearance."